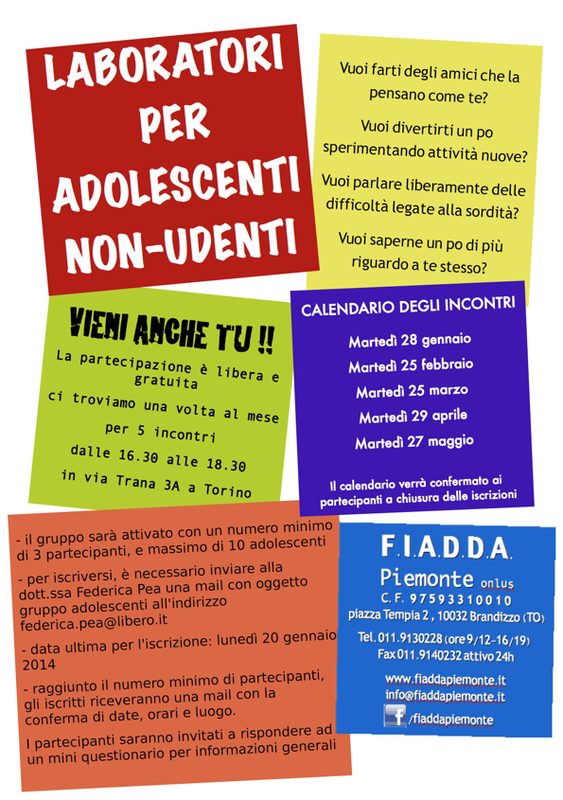 Fiadda Piemonte launches a free laboratory addressed to teenagers with hearing impairment. The laboratory will be conducted by Federica Pea, following the collaboration started in early November with the free event under the patronage of the Regional Board of Psychologists. The laboratory is structured on five group-work sessions under the support of Federica Pea, a deaf psychologist with a massive experience in supporting deaf teenagers and their families. Federica is also a consultant for the town Juvenile Court, the Municipality SSGIs and the regional deaf association, and a university researcher. The laboratory is addressed to all teenagers with hearing impairment, including deaf youngers with prothesis, cochlear impants and signers. The participation is free and open. The groupwork sessions will take place in via Trana 3/A, co. the Municipal Dep. for Sensory Disabilities.